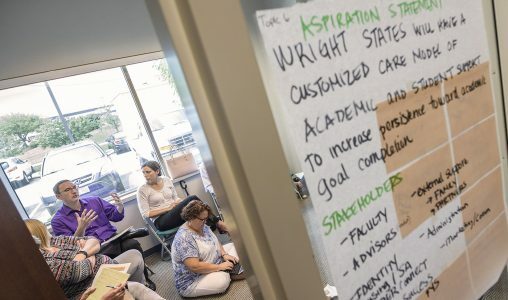 Some were huddled in chairs … others on the floor … and still others were standing in doorways leaning in to join in the many conversations that will evolve into Wright State University’s next strategic plan. Sharing … explaining … listening … ideas building one on another. 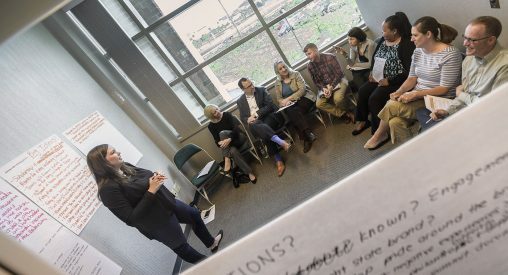 Hundreds of large sheets of paper, scribbled with ideas, were a fitting backdrop for the university’s third strategic planning mini-summit on June 22. 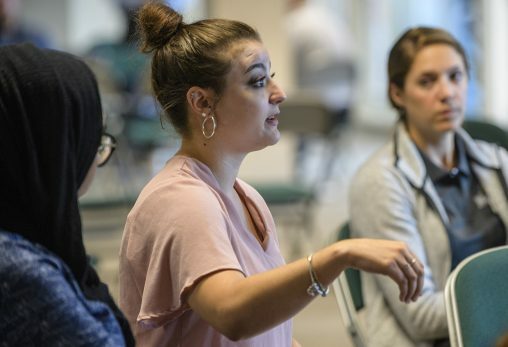 Approximately 150 faculty, staff, students, alumni and community partners gathered together to propose and evaluate potential projects and activities that could have high impact on Wright State. Doug Fecher, chair of the Wright State Board of Trustees and CEO of the Wright-Patt Credit Union, challenged participants to think radically. Fecher explained that the board is not looking for a strategic plan for today’s world of higher education, but rather one that invents a university of tomorrow because the environment of higher education has changed so markedly. Gloria Pappaterra, a political science and sign language interpreting student, offered suggestions and a student perspective to the Community, Diversity and Globalization working group. Pappaterra, who has been participating in the Community, Diversity and Globalization working group, said this experience has made her feel more valued. Ideas were flowing freely at the summit. A few of the many ideas included: creating an Experiential Learning Hub that is collaborative among units on campus, having a variety of class delivery methods to make classes and materials more accessible, creating a central committee to facilitate more collaboration in inclusion and diversity efforts, ensuring collaborative delivery of academic support services, and creating an e-campus with more online courses and services. The next mini-summit on July 13 is being billed as an “idea marketplace,” where participants can visit each of the 15 strategic group “storefronts” and select a limited number of ideas that they “buy in to.” Groups will then review feedback and decide which of the ideas they want to continue pursuing. There is still opportunity to join the strategic planning process. RSVP through the strategic planning website. Sessions will be held from 8:30 a.m. to noon in the first-floor gallery space at 2455 Presidential Drive. During the June 22 mini-summit, the strategic initiative working groups explored proposed projects and potential benefits to Wright State.